The Alzheimer Conundrum exposes the predicaments embedded in current efforts to slow down or halt Alzheimer’s disease through early detection of presymptomatic biological changes in healthy individuals. Based on a careful study of the history of Alzheimer’s disease and extensive in-depth interviews with clinicians, scientists, epidemiologists, geneticists, and others, Margaret Lock highlights the limitations and the dissent implicated in this approach. 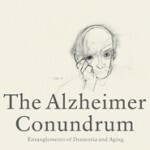 To read more about Margaret Lock’s book The Alzheimer Conundrum: Entanglements of Dementia and Aging, please visit the Princeton University Press website here. You can learn more about Dr. Lock’s work here. This report examines the concept of cognitive aging, its impact on public health, and the research and education needed.